Mad Minerva 2.0: Movie Review: "Guardians of the Galaxy"
Movie Review: "Guardians of the Galaxy"
It's only fair to quote Chris Pratt's first triumphant movie of 2014 to describe his second. Besides being a bit of meta-review, it has the benefit of being absolutely true. I have run out of superlatives to describe Guardians of the Galaxy, Marvel's thrilling confection of a comic book space opera that seems completely improbable on paper but blooms into a giddy display of unmistakable movie magic on screen (plus $94 million on opening weekend ain't bad!). Guardians is not just two hours of action-comedy with a ragtag band of lovable misfits, an engaging retro-pop soundtrack, stunningly beautiful special effect spacescapes, and two of the best scene-stealing CGI characters ever created. It's also a movie that recaptures the childlike, heart-pounding delight of seeing flicks like Star Wars or the even-numbered Star Treks or Raiders of the Lost Ark - movies that set your imagination on fire, filled your head with landscapes you'd never dreamed of before, and had you strutting out of the theatre thinking you were no longer plain old you, but Han Solo or Captain Kirk or Indiana Jones himself. Guardians of the Galaxy is exactly that kind of movie. I spent the entire time in the theatre sitting with a big silly grin on my face and feeling about 10 years old, and I can't wait to see this flick again ... and again ... and again. I don't want to say too much lest I give you spoilers, but I will say this: consider this with May's (also excellent) Captain America: The Winter Soldier as not only the two temporal bookends of the Marvel summer, but also the two poles of the Marvel approach. Captain America: The Winter Soldier was at its heart a serious commentary on a number of highly topical political issues (see: the surveillance state). Guardians of the Galaxy, on the other hand, is a fly-by-the-seat-of-your-Captain-Tightpants, devil-may-care, why-the-hell-not comedy. Both movies contain thoughtful considerations of relationships, ethics and morals, and heroism, but they do with from completely opposite ends of the tonal spectrum ... and they both do it brilliantly. 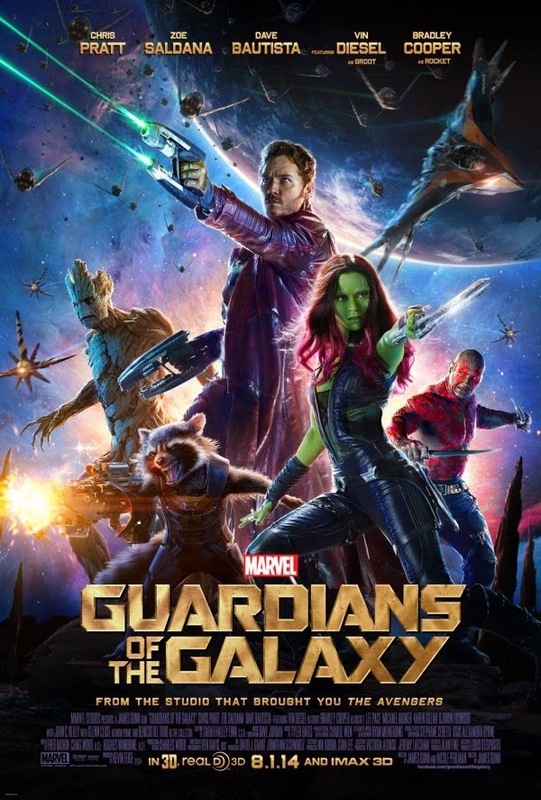 I'll just note the main cast: Chris Pratt of Parks and Recreation is delightful as lovable rogue Peter Quill; Zoe Saldana is Gamora, a green-skinned alien who is as far from an Orion girl as you can imagine (she's an assassin); Dave Bautista is Drax the Destroyer, a mountain of a figure who also has a problem with metaphors; Bradley Cooper voices Rocket, a hilariously bad-tempered genetically-engineered raccoon with a fondness for weaponry; Vin Diesel voices Groot, a massive sentient tree (no, really! and you'll love him too!) who has a rather limited vocabulary. Circumstance throws these five troublemaking oddballs together, and the rest is pure magic. As for complaints? I will have to point out again that Marvel has a problem creating textured, complex villains (aside from Loki). Djimon Hounsou's Korath, Lee Pace's Ronan, and Karen "Amy Pond" Gillan's Nebula all seemed mostly one-dimensional, and a lot of their motivation could be summed up in the word "MacGuffin." Yet for all the (little) flaws, Guardians is one big, zany, irreverent thrill ride that also has a surprising amount of heart. You'll laugh, you'll cry, you'll love every moment of it if the audience in my packed opening night auditorium was any indication. There was sheer delight in the air amid the gales of laughter and real emotional investment during several other moments. Also: if by movie's end you aren't affectionately attached to Rocket and Groot, there's nothing I can do for you. PS: This is a Marvel movie, so be sure to stay until the credits are over. Mad Minerva gives Guardians of the Galaxy a grade of A+ and the crown of Best Movie of Summer 2014. RottenTomatoes gives the movie the bona fide Fresh rating of 92%. Guardians of the Galaxy runs 121 minutes and is rated PG-13 for sci-fi action and alien violence, some language, and Chris Pratt's abs. "No Longer Even 'Leading From Behind'"
Hello Kitty Monstrosity of the Day: WHAT? Quote of the Day: "Unprecedented Disarray"